Oregon Attorney General Ellen Rosenblum announced today the filing of a federal lawsuit against the U.S. Environmental Protection Agency alleging the agency has failed to adequately limit air pollution emissions from new residential woodstoves and heaters. Oregon, New York and five other states allege the EPA’s 25 years of inaction on woodstove emission standards violates the Clean Air Act. The states allege EPA’s existing emissions limits are outdated and leave out popular types of residential woodstoves and heaters. 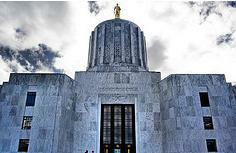 The Oregonian is reporting that Oregon environmentalists are eying a small power shift in Oregon’s Legislatures due to a possible three openings in the Legislature which could have a big impact on environmental legislation. Here is the change. – State Senator Jackie Dingfelder is leaving her office to work for Portland Mayor Charlie Hales. – State Representative Mike Dembrow is expected to run for Dingfelder’s open seat which would create a new seat in the House. – State Representative Jules Bailey is leaving her office to run for Multnomah County Commissioner. Read more on how these seats are important to Oregon’s environmental community. Paulette Pyle, Director of Grass Roots for Oregonians for Food and Shelter (OFS), was honored Monday (October 14) with the Ted Young Award at the annual meeting of the Oregon Forest Industries Council (OFIC) in Sunriver. The prestigious award is presented annually to a member of the OFIC family who exemplifies the virtues of the late Ted Young – a hardworking, dedicated person of immense integrity, whose word means something. The award recipient is committed to community, family and the forestry profession. Continued state control of water rights is critically important to farmers and ranchers, the American Farm Bureau Federation told Congress. “Farm Bureau supports H.R. 3189, the Water Rights Protection Act, because it is designed to dispel uncertainty and recognizes state sovereignty and historic water law,” said Randy Parker, CEO of the Utah Farm Bureau Federation, testifying to the House Natural Resources Subcommittee on Water and Power on behalf of AFBF. Further, noted Parker, H.R. 3189 recognizes states’ sovereign water rights and protects livestock water rights from illegal federal claims and takings. Parker said some Utah ranchers have been asked by the Forest Service to sign “change of use” applications that would allow the agency to change the use of the water from livestock to other uses. Ranchers were also told non-compliance could adversely affect them being able to “turn-out” cattle on FS grazing allotments. Support for Food Labeling Initiative Swings Negative 41 Points Since September.What a difference a month and a few million dollars makes. 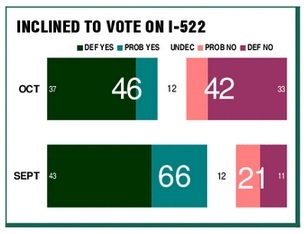 Initiative 522, which would mandate labeling of genetically modified food, was leading by just 4 points last week after posting a 45-point lead five weeks ago–before the advertising campaigns had begun. Support dropped 20 points while opposition increased by 21 points, including an increase from 11% to 33% who said they would “definitely” vote against it. Both sides are advertising heavily in what may be the most expensive initiative campaign in state history. Communities for Healthy ForestsWildfires are burning hotter and bigger than ever before. It’s not a sentiment that’s exactly new, we’ve heard it several times before. But analysis of recent fires across the Western United States is showing scientists that this year’s forest fires raised the stakes yet again. But why are wildfires increasing in size and temperature? And what makes scientists so sure that the trend is poised to continue? Climate change is a contributing factor to more intense fire seasons. Warmer winters mean less snow, which melts sooner and decreases runoff. As a result the forests dry out earlier prompting fire seasons that start earlier and last much longer. Congress apparently has reached an agreement to fund the federal government and raise its self-imposed debt limit, and President Obama has indicated he will sign it. This will lift a 16-day government shutdown as well as the threat of a government credit default. But that’s not the only logjam that’s being cleared in our nation’s capital. The long-stalled Farm Bill is now moving to a conference committee, and Rep. Kurt Schrader (D-Ore.) is among those who will serve on the panel. The committee is charged with working out the differences between House and Senate versions of the bill, which both passed several months ago. The biggest difference concerns cuts to the Supplemental Nutrition Assistance Program (SNAP), formerly known as Food Stamps. Congressional leaders’ moving forward on negotiations to resolve differences between the Senate and House versions of the 2013 farm bill is a commendable step but much more remains to be done, according to the American Farm Bureau Federation. Overall, both the Senate and House bills provide an adequate food and farm safety net for consumers and farmers, built around options that are consistent with AFBF policy, AFBF President Bob Stallman noted in a letter to conferees detailing Farm Bureau’s views on an array of issues related to the legislation. “Farm Bureau’s two overarching concerns related to the Senate-House conference on the farm bill are ensuring that permanent law is not repealed and a complete, unified bill continues,” said Stallman. Purchasers of federal timber sales and stewardship contracts filed suit yesterday against the Forest Service and the Bureau of Land Management (BLM). They are asking the Oregon Federal District Court to enjoin the agencies from suspending timber contracts during the government shutdown. The American Forest Resource Council (AFRC), an industry trade association, joined an action brought by Murphy Company, High Cascade, Inc. and South Bay Timber, LLC. One person not on the current list is the American farmer. Now sure, one could say that listing categories of people could open the door to many groups worthy of the list, such as soldiers, police officers, firefighters, teachers and so on. Why list the American farmer? One reason is that we as Americans enjoy one of the highest standards of living in the world. Much of that standard is a direct result of farmers and their daily efforts to provide affordable food for our country.